Polish Talmudist; born about 1625; died April 24, 1681, at Kleinsteinbach, Bavaria. As a wandering scholar he is found for a time at Meseritz and then at Halberstadt. In 1660 he was rabbi of Bamberg, with his residence at Zeckendorf. His stay here was of short duration, for he made many enemies through his violent temper and the self-assertion which he displayed in his new office; and it was in vain that his relative and subsequent successor warned him that he would endanger his position if he did not heed the views of the German scholars; for he had even dared to set up his own scholarship against the infallibility of MaHaRIL by saying: "Knowledge is free; I will speak openly even before kings; for the philosophers have not idly used the simile of the dwarf who bestrides the, shoulders of the giant." In view of these circumstances it is not surprising to learn that Samuel resigned the rabbinate about 1665—whether voluntarily or not is not known. During the period of enforced idleness that followed he prepared for the press the manuscript of his "Naḥalat Shib'ah" (see below). At length he found a position in the unimportant rabbinate of Kleinsteinbach, where he remained until his death. In spite of his great scholarship and wide reading Samuel still showed himself the child of his time in believing in magic and the black arts as well as in the Messiahship of Shabbethai Ẓebi. 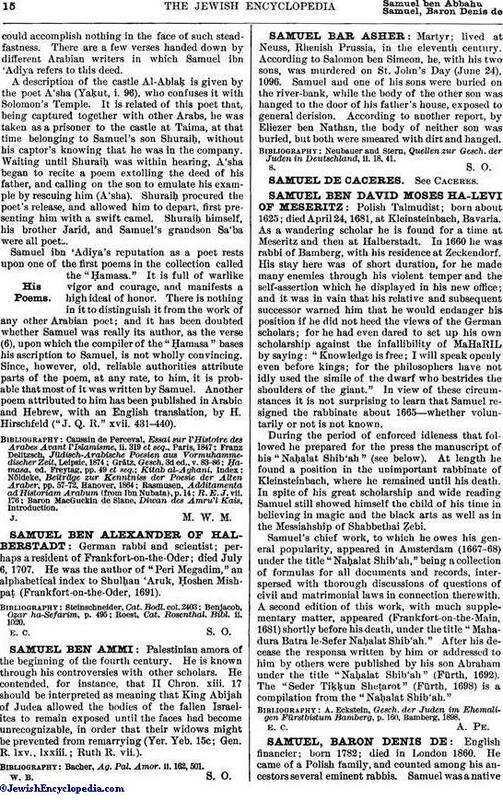 Samuel's chief work, to which he owes his general popularity, appeared in Amsterdam (1667-68) under the title "Naḥalat Shib'ah," being a collection of formulas for all documents and records, interspersed with thorough discussions of questions of civil and matrimonial laws in connection therewith. A second edition of this work, with much supplementary matter, appeared (Frankfort-on-the-Main, 1681) shortly before his death, under the title "Mahadura Batra le-Sefer Naḥalat Shib'ah." After his decease the responsa written by him or addressed to him by others were published by his son Abraham under the title "Naḥalat Shib'ah" (Fürth, 1692). The "Seder Tiḳḳun Sheṭarot" (Fürth, 1698) is a compilation from the "Naḥalat Shib'ah." A. Eckstein, Gesch. der Juden im Ehemaligen fürstbistum Bamberg, p. 160, Bamberg, 1898.